I've been thinking for a month or so now about OpenStreetMap and things that I can do to help out the project - besides the data collection and mapping I've been doing since the start of the year. It all began when I was wondering what the difference in cost would be to an organisation (Futuresonic in this case) between licensing Ordnance Survey data and actually going out and mapping an area themselves. I wouldn't say the two data sources are directly comparable, but both could meet a given need for an organisation. Often the detail of the OS data would be overkill for orangisations wanting simple maps for context, and potentially very expensive depending on how it's used. OpenStreetMap data, on the other hand, may not have as good coverage - though with time and energy it can be easily extended - but it would be available without the cost. So, one of the ideas that I've come up with recently is for weekend mapping projects. The basic idea of a weekend mapping project is that I would offer organisations, groups or individuals a weekend of my time to map as much of an area as I could feasibly do in a whole weekend (with extra time afterwards to convert the GPS traces and any annotations such as road names into usable map data). I think it would be fair to ask for those people to pay for low cost flights from my base to their location, bike rental or something for the actual GPS track collection, and a small amount to cover some cheap accommodation and food for the time I'm there. In return they get free map data onto which they should be able to build, adding their own information and styling to make the maps unique to their own needs. Why would I offer my limited free time to do this though? Well, quite simply, I really enjoy travelling and seeing new places. I'm also really interested in the idea of open, reusable, community-created content, especially in the form of OpenStreetMap for geographic data, but also Wikipedia for general reference information. So, if I can travel to new places and map them out to help expand the OpenStreetMap dataset, it's hitting on both of those desires in one go. If anybody is interested, please do get in touch and we can talk through the details. Updated 15 July with link to page on OSM wiki. Some other community members are interested too, and the more the better as that means sponsors would have a better chance of finding someone close to them, and so have lower travel costs. It's been a year since Google Maps was introduced and look at what's been done with them. I'm really looking forward to what's in store at the Where 2.0 conference this year - if only from the other side of the Atlantic. Google seems to be opening up more and more of late. They've been offering APIs for their search and maps for a while, but they've mostly allowed information to be pulled from Google to be used elsewhere. Until relatively recently, that is. I'm thinking through a number of possibilities for the Subscribed Links API that lets you feed your own information into the Google search results of people who have subscribed to your information. The thing I'd really like to implement with this would be an OpenStreetMap searchlet that gives you a link into the relevant place in OpenStreetMap whenever somebody searches for 'Maps of [Place]' or '[Place] maps'. It would only work for people who have actively chosen to include the links in their Google search results, but I still think it would be a useful thing to do for those that wanted it. Google even provide a database of cities for people to plug into wihtout having to supply the data themselves, but unfortunately it only works with US cities and only returns a zipcode. It'd be nice if it worked worldwide and returned geographic coordinates as well, then it would be really simple to link into a map from OpenStreetMap. It's interesting to see at the moment that cigarette companies seem to be turning to geography to help market their products in Germany. Camel is using advertising it's brand on Bus stops (see left, ignore reflections) using a tactic reminiscent of Multimap's advertising in the UK a few years back which made street patterns in London into shopping trolleys, computer mice, etc. 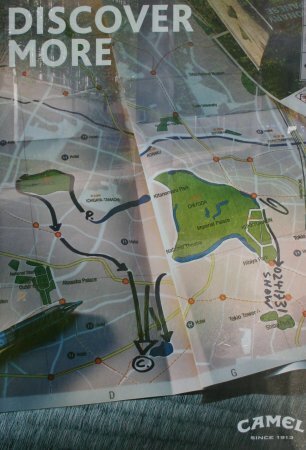 In this case Camel have made a camel shape out of the streets and pen annotations on the map. Meanwhile, Marlboro are advertising the chance of winning some cool looking new GPS navigation devices. Shame I don't smoke, it'd be nice to have one of those things. I wonder what the sudden attraction to geography is for the tobacco companies? Is it things like Google Earth that have made their customers more aware and more receptive to maps and location? In the past few days I've spent at least four hours out walking around the city trying to map as many streets as possible in the area in live in - Stuttgart West. It's great to get out there - even if it does start raining - and explore the area around me. Once the spring and summer arrive, I'll start cycling around with my GPS and my camera as well. Exploration, photography, geography and keeping fit, all in one. If you've not yet tried OpenStreetMap, what are you waiting for? Why not get out and explore your surroundings. Careful though, it's addictive! Since my initial contributions to the OpenStreetMap project back in January I haven't added much more data to the system. Having no access to a car at the moment, I've not been able to get out and about exploring the area around Stuttgart and take tracklogs as I go. That, and when I was using the OSM site back in January, it had become incredibly slow as the size of the project grew so quickly. Last week I recieved an email from someone planning on doing a Masters dissertation on the OpenStreetMap project. What's more, he's from the Isle of Man, and doing the same course that I did last year. A little while ago, I managed to get another person from the Isle of Man involved in the project. He's now going out with his GPS, cycling around Port St Mary and then adding his tracks to OSM. There's a workshop being planned on the Isle of Wight in May at which there's a group of people (who I will join, if I can get there for the weekend) that have a goal of mapping the whole of the island on OpenStreetMap. This last weekend, one of the OpenStreetMappers gave me the incentive to classify the data I'm inputting and have already input. He came up with a XSL stylesheet that transforms the raw geodata from the OSM API into an attractive SVG image (sorry to use so many TLAs) that can then be manipulated in other applications. It's the first time I've seen my data visualised in any sort of flexible way, and most importantly the first time it's hit me just how important it is to tag the data (with road names, types, etc) as you put it into the system. Without seeing the effect of your tags, there's no incentive to tag it. I tried out the desktop based JOSM editor that lets me edit everything locally and upload any changes - including the ability to tag everything. It's a shame I can only use it on a PC though, so I can only use it after work before going home to my iBook. The site itself is now running at an acceptable speed again, so there's not too much delay when adding data. Right now there is a very important discussion going on in the mailing lists about the type of license that OpenStreetMap data should be released under, what people should be allowed to do with it, and how they should be able to use it. It's great to read so many people's opinions on the topic, especially as none of the existing open source licences really cater for the needs of open geodata. It also demonstrates just how active and involved the community is. All of this, along with a bout of nicer weather here in Stuttgart (until yesterday) has made me get my GPS out again and start mapping some of the streets of Stuttgart. I'm thinking small streets that I can walk through and explore instead of roads that, in order to map, I'd need to drive along. A few days have passed since returning from my weekend visit to Hannover and CeBIT, and I'm nearing recovery from the night-travel induced sleep deprivation over the two days. It was a good trip, if only to learn how not to spend the day at large fairs - and that a day probably isn't long enough. I was visiting the fair with a colleague, who, like me, was hoping to see all the new gadgets that had been hyped in the run up the event. What we didn't realise is that visiting a fair requires some planning before the event to make sure you can fit in the things you want to see as well as a good selection of the other stands. We missed out on a big chunk of the stuff we wanted to see having lingered for too long in the other sections. Seeing everything on display is not an easy task in an area that's almost half a million square metres in size, and it's unbelievably easy to get sucked in to the stands as you go along. Personally, I was amazed at the amount of geo-related goods and services that were being exhibited - from data providers such as Navteq and Teleatlas, through handheld GPS, mobile phone integrated GPS navigation systems, in-car navigation systems like TomTom (this was probably the biggest share of goods, including many models from China hoping to take a chunk of the market) and a variety of other things. There was also a lot of information from government entities, from both regional and national mapping authorities in Germany and from other European countries. At some point I will attempt to wade through the German literature and find out what's going on in the geospatial world here in Germany. Perhaps I'll write more about some of the exhibits as and when I get a chance, but for now, check out some of the CeBIT photos from PocketGPSWorld.com. Before Jeeves was given the boot retired after ten years of service, it seems he was given the task of travelling Europe for Ask.com's next big offering, Ask.com Maps and Directions. Despite the default view of Ask.com Maps being the typical America-centric view of the world, they appear to be the first new AJAX-y style mapping provider to cover Europe in any detail. They give road maps for all of the European Union countries, plus a few others, including Moscow. In addition, they give much higher resolution aerial photos for Stuttgart and probably for other cities as well, though I must admit I didn't check. They even have road data for the Isle of Man, but sadly no higher resolution aerial imagery of the area. It's all much better than Microsoft's poor geodata offering and Google's lack of European data outside of the UK and the Torino area of Italy. One area that definately needs work in the new Ask.com Maps service is the search, which seems patchy at best when looking for places outside of the US. Oh, and it's not the fastest of services either, but for now I'm happy to put up with that in return for the vast improvement they have in geodata over the other providers. If the ability to link in to the service was simplified, I'd be happier too. And I'd be bowled over if they produced an API for their service.